Last week’s contest was won by wes.in.wa. It was Tacoma. This one is related to something in the news from May, good luck! It’s a church. Did someone get shot in a church? There are so many shootings I can’t keep track of them all. Dang! Just got here, 12:12, and you got it already! 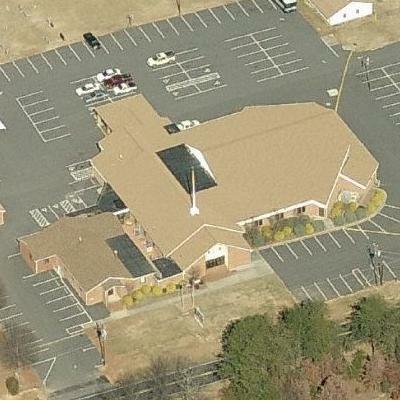 Is this the church of that hateful Christianist who was calling for death camps for gays and lesbians? Yeah, that’s the one. Apart from the disgusting homophobia, I dislike how they left that one pathetic little patch of grass out front, while surrounding the rest of the building with a parking lot. Pastor Worley’s idea to eliminate gays by fencing them off and dropping in food until they “die off” won’t work. Why? Because gays are being born in the general population every minute! Where does this bozo think the homosexuals and lesbians came from in the first place? They all — yep, every single one of ’em — were born to heterosexual couples! This twit must think homosexuals and lesbians were getting together to produce gay kids, and that if you separate them … voila, no more gay kids! Homosexuals and lesbians happen because a certain percentage of people are born gay. Or, if you don’t buy that, and believe homosexuality is a learned “behavior,” then what’s to prevent “normal” people living in the general population outside the fenced-off areas from learning this “behavior”? The bottom line is that if you seperate gay people from the rest of us, and confine them (or kill them), there still will be gay people among us — unless the whole human race stops reproducing, which is fine with us rabbits, because there’s already too many humans clogging up the ecosystem. I thought it was interesting that he said he would first build a fence for the lesbians, then more for the queers and for the homosexuals. Sounds like three fences to me. About the Bing picture, it looks to me like the half-wit would be better off setting up a Rick Perry style prayer meetin to pray for rain, since it looks dry as a bone around that church. Turns out North Carolina has been undergoing a long-term drought, no doubt because Gawd has betrayed them for some indiscretion or other.